The UT Arlington MBA program is a 45-credit hour program that is offered in both flexible and cohort structures. Students who follow the flexible program structure can begin the program in the fall, spring, or summer and take courses part-time or full-time, depending on their schedule. Courses for the program are held on weekday evenings. The Professional Cohort MBA structure also follows the same 45-credit hour curriculum as the MBA flexible structure. The difference between the two structures is that students in the cohort structure complete classes together in a lock-step format. The cohort structure allows students to complete courses in accelerated five or eight-week sessions, which allows students to complete their MBA in 24 months. This format is only offered at the Fort Worth campus. Students complete three courses each fall and spring semester and one or two courses each summer session. Despite the program structure, all students complete the same required 45-credit hour curriculum for the UT Arlington MBA. Students complete 18 credits of core courses, 15 credits of advanced program courses and 12 credits of electives. Students in the flexible program can choose a concentration area, while students in the in cohort program can’t. The core courses provide the foundation of knowledge needed for students to complete advanced program coursework successfully. The advanced program coursework is built upon a culmination of the core coursework. Students use the knowledge and skills learned in the core to complete these advanced courses. Students must also complete 12 credits of elective courses. UT Arlington MBA students can take courses in different areas or choose to specialize in one area such as accounting, economics, finance, information systems, management, operations management, or marketing. Students can use the elective courses to develop business skills and perspectives essential to their career goals and objectives. UT Arlington MBA students holding bachelor’s or master’s degrees in professional fields such as architecture, education, engineering, nursing, social work and urban studies have the option of taking up to 12 credits of approved electives in their professional area to develop management skills in that area. Students also have the option to complete an approved study abroad program or internship to satisfy one elective course. The UT Arlington Professional Cohort MBA structure is created for experienced professionals who want to continue to work full-time. The flexible MBA is for those who just recently completed their undergraduate program, those who can take time from work to complete the program and those looking for a part-time program so that they do not have to disrupt their career. Of the 6,027 students enrolled at UTA’s College of Business there are 1,314 students enrolled in master’s programs. The average GMAT of master’s students is about 497. Forty-two percent of College of Business students are women, 85 percent are Texas residents, and more than 70 percent identify their ethnicity as being something other than white. 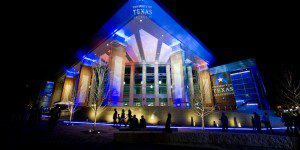 The UT Arlington MBA is designed to help experienced professionals to move into management and executive positions and for professionals just starting their career to gain a competitive advantage in the business field. Students at the College of Business have access to the Career Development Center, which works with current students and alumni to prepare for their careers. Services offered include meeting with students to help them create a career plan, getting them connected with employment opportunities, and helping them to practice various job skills that will help them to land a job and succeed in that job. The estimated cost of the MBA program at the University of Texas at Arlington College of Business is $25,382. This estimated cost is for full-time MBA students that are Texas residents. The cost includes books and supplies, room and board, transportation and miscellaneous costs that students may encounter while completing the program. Graduate students paying the non-resident tuition and fee rate should add approximately $9,300 to the estimated cost of tuition and fees. The Office of Financial Aid and Scholarships at UT Arlington offers a wide variety of scholarships, grants, work, and loan programs to assist with funding for the MBA program. The school offers graduate assistantships to MBA students who are in need of financial assistance. Stipends for graduate assistantships start at approximately $6,000–6,500 per nine-month academic year for master’s students. Assistantships are awarded on the basis of a student’s academic achievement and the needs of the College. Recipients of assistantships are expected to work for the College for approximately 20 hours per week. Duties will be assigned on the basis of the needs of the departments and the qualifications of the graduate student. In order to be considered for admission to the College of Business at the University of Texas at Arlington, prospective students must submit the online application, application fee and supporting documents. Supporting documents include official transcripts and GMAT scores. International students are also required to provide official TOEFL scores and Bank Affidavit and Financial Statement if the student is seeking a student visa to enter the United States. Students who meet initial admission criteria will be asked to provide a copy of their professional resume, a 200-word personal essay describing why he/she wishes to complete the MBA and why he/she has chosen UT Arlington to do so and three letters of recommendation.